Central Asia is a brittle but largely stable region. The region’s post-Soviet, authoritarian regimes are blighted by corruption, human rights violations and ethnic disputes. However, recent political developments following the leadership shift in Uzbekistan in 2016, demonstrate a move towards more constructive regional cooperation. The region is of strategic interest to major powers including China, Russia and the US, given its proximity to Afghanistan and location as a bridge between Europe and Asia. In the medium-term, climate change is forecast to put increased pressure on the already constrained relations between countries in Central Asia: Kazakhstan, Kyrgyzstan, Tajikistan, Turkmenistan and Uzbekistan. Water and energy have been defining factors of interstate and intercommunal relations in Central Asia since the states became independent in the early 1990s. Today, Central Asian states depend heavily on extractive industries, most notably coal, oil and gas. Here, climate impacts and climate change mitigation and adaptation, is projected to heighten tensions between countries in the region. Tensions increase between downstream and upstream countries due to rising water stress: Management of water resources between the upstream hydro-rich and downstream carbon-rich states remains contingent on the changeable political will of regional leaders. This poses multiple risks as the climate changes and water stress grows. As water variability from glaciers increases, there will be more frequent disruption to generation in upstream hydropower plants. And if more water is held back in upstream countries, resources for irrigation in the downstream countries will diminish. In the absence of a functional, enforceable energy or water exchange systems, water may become weaponized and a cycle of retaliation could be triggered. 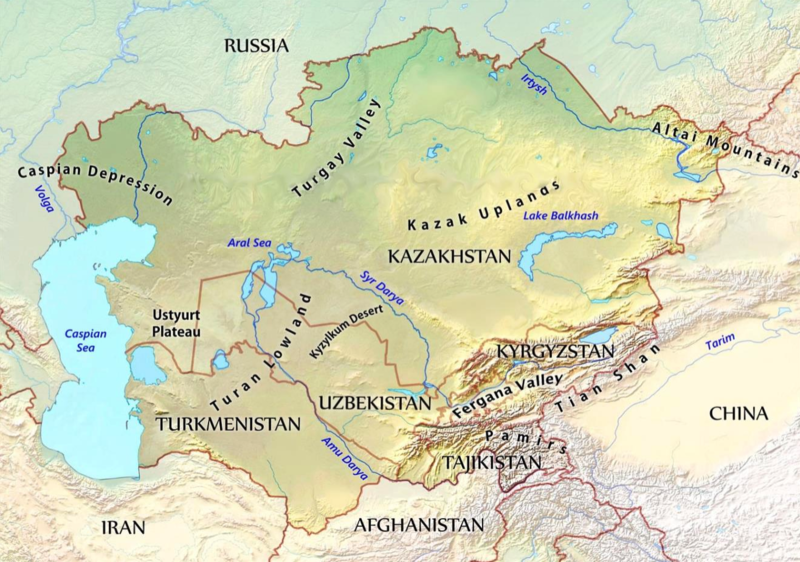 Border conflicts intensify as climate changes reduces access to natural resources: In the Fergana Valley where borders between Kyrgyzstan, Uzbekistan and Tajikistan are not fully delimited, the ethnic patchwork of enclaves does not follow the state frontiers. People compete for land and water, claiming access based on natural rights, historical precedents and perceived principles of fairness. Squatting and abuse of administrative power are common practice. Climate change will increase uncertainty of water supply, which could leave lands unproductive and destabilize livestock breeding, making both nomadic and sedentary livelihoods untenable. In the absence of mutual trust and functional resource sharing arrangements, desperation could aggravate historical disputes, inflate prejudice and misplace the blame. Climate-insensitive development erodes regional capability for cooperation: Technical capacity to develop modern economies is lacking across the region, limiting foreign direct investment. However, fossil fuel extraction remains an anomaly which does attract investment. Carbon rich Kazakhstan, Turkmenistan and Uzbekistan extract and use oil, gas and coal for their energy production. Meanwhile, the Central Asian countries with lower GDP/capita - Tajikistan and Kyrgyzstan - use clean hydro energy. This inequality breeds a sense of injustice which is further compounded by disparities in exposure and adaptive capacity in Central Asia - the most vulnerable have the least capacity to adapt. As climate change and low carbon resilient transition intensify, these inequalities can limit the cooperation required to embrace and address transboundary opportunities and challenges. Social instability escalates as a result of unmanaged climate and energy transition impacts: Extreme weather could cause energy and food access restrictions and threaten to destabilize vulnerable communities. Unmanaged transition from carbon and water-intense economies may lead to dramatic shifts in revenue projections and rapid job losses. This risk is heightened by weak and corrupt institutions which limit the potential to assist vulnerable populations. Further, in a region where the primary strategy to manage social tensions and opposition has been through violence and repression, social shocks could result in rapid surges of violence. Corruption, a lack of transparency and public participation each help diminish the region’s capacity to prevent social shocks (Source: World Bank 2017, Transparency International, 2017). In responding to Central Asia’s climate change and security context an integrated and cooperative approach is required. The report provides four recommendations that recognize the importance of dialogue, advocacy, technical assistance and convening as tools for conflict prevention. 1) Develop open-access independent data to support monitoring and evidence-based management of climate-related security risks. Reliable and open-access data can help inform effective policy and avoid weaponization of ‘hidden’ data. In Central Asia, limited access to independent data is currently preventing effective early warning and response. An upgrade in capacity for independent scientific analysis, and integration into the global climate change monitoring networks could help prevent misinformation and political campaigns which heighten domestic and inter-state tensions. Central Asian leaders and the security services typically consider this type of information sensitive. Currently, data on climate and natural conditions is classified, citing concerns about national security. However, an independent and open-access data set could help broker cooperative engagement and management of shared risks. 2) Conduct a cost-benefit analysis of cooperative frameworks for early warning and disaster relief. The geography of Central Asia means citizens of one state may be in closer proximity to the relief services of a neighbouring state. However, transboundary early warning and disaster relief has not yet been established. The political geography of the region favours isolation over cooperation and countries are particularly sceptical about any adjustments to national security protocols. Conducting a cost-benefit analysis of potential models for regional frameworks could help build a case which helps unlock political will. 3) Provide technical assistance to develop feasibility assessments for low-carbon resilient infrastructure and accompanying social transition policy. At present foreign direct investment in the region is low and does not prioritize low carbon resilient investments. Technical support to undertake feasibility assessments could help unlock opportunities for low carbon resilient investments in the region, including those as part of the Belt and Road Initiative. For example, in addition to renewables investments, there are considerable opportunities to modernize agriculture and industrial practices which could yield significant efficiency savings. In tandem, social policies including re-training, support for entrepreneurship and improved mobility could help facilitate a just transition from high-carbon industries to low carbon-resilient alternatives. Public participation in the decision-making process should also be supported to manage social tensions associated with transition and infrastructure construction. 4) Facilitate a regional climate change dialogue: Climate change is currently considered a neutral topic for regional engagement. However, as climate change impacts worsen, state relations could become more toxic without cooperative early-action strategies. As a trusted broker, the United Nations Regional Centre for Preventive Diplomacy for Central Asia (UNRCCA) could open a regional climate change dialogue and involve governments, local government, investors, international organizations and civil society. The dialogue could help build support for the recommendations above and help identify common needs and opportunities for climate mitigation, adaptation and climate-related security management strategies.